– The library’s operation and function is managed and maintained with the supervision of the LRC Head. 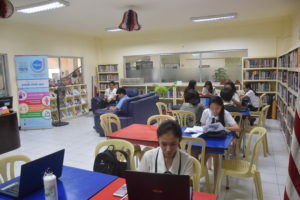 The office is responsible for reservation of the use of library facilities like discussion room, library lobby, American corner conference room and the JRR Dizon Library Technology Center. Referrals to other libraries may also be requested in the office. 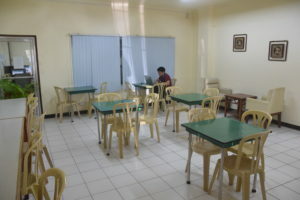 – The faculty reading room is intended for faculty use only most especially faculty members doing research. 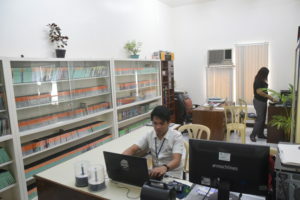 It is situated at the ground floor besides the LRC office. – The periodicals section contains newspapers, journals, magazines and other serial literature. Pamphlets, vertical files, brochures and clippings are housed in this section. 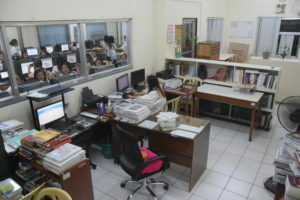 Current issues of newspapers and journals are displayed in this area. All materials are for room use only. – Faculty are allowed to borrow periodicals for three (3) days only except for current issues and not renewable. – This section houses the CDs/DVDs and other multimedia instructional resources. Faculty members can preview and borrow CDs and DVDs for their classroom instruction. Request for downloading of documentary materials needed for instructions is accepted here. This room is for faculty use only. – The center is named after Joaquin Rafael Raymundo (JRR). 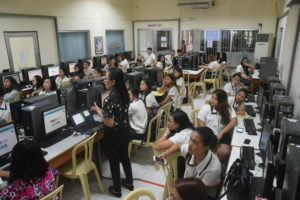 Dizon Foundation provides internet services to students. A student is entitled to use the internet on hour (1) every day for their research and can be extended upon request for another hour or so. Only bonafide students, faculty and staff care allowed to use the library technology facilities. – The center is also used for classroom instruction of faculty having research class using the internet or library online databases. The reservation is done in the LRC Office 3days before the scheduled date. First come first serve basis. Food and drinks are not allowed in the facility. One person for one computer only. Attachment of personal hardware to computers is not allowed. The library is not responsible for any loss, misplaced or stolen personal items. – This section is in-charge of the organization of library materials before they are put into circulation. The process includes classifying, cataloging, accessioning, stamping and covering of books. Preservation and repair of the collection is also done in this section. Other technical services activities include the preparation of the list of newly acquired library materials, bibliography request by faculty and the inventory of the library collection. Only the technical services staff on duty are allowed in this section. – The American corner provides a window of life and culture about the United States of America. It is a partnership with U.S. embassy through Thomas Jefferson Information Center (TJIC). TJIC maintains and coordinates a network throughout the country. The corner provides an array of information about the United States of America. – This section is located at the ground floor upon entering. The circulation section is responsible for checking out and returning of library borrowed materials, management of collections and other related services to users. 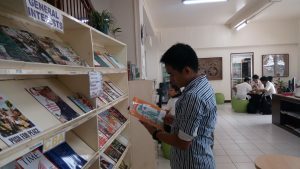 – Circulation section is where Non-Filipiniana books are lent out for home use. Students are allowed to borrow three (3) books at a time for three (3) days and may be renewed for another three (3) days for three (3) times unless called for by another user. – A drop box is provided at the entrance of the Library for borrowers who wish to return the books they borrowed on or before the due date and even if the library has no service. This is regularly checked by the librarian. – Library users are reminded that all library resources, print and non-prints materials are the property of the University of St. La Salle and must not be taken out from the library without proper authorization. Vandalism or commission of such acts constitute on offense and carry with it corresponding sanction that is imposed by the College Discipline Board.